When a child is recovering from surgery, whether it is from something minor or something much more serious, the doctors and nurses assigned to that child’s case are life-savers. They are the ones prepping the child for surgery, the ones performing the surgery, and the ones helping the child through recovery. Pediatric doctors and nurses play a vital role in the healthcare system, but a group of people you may not have heard of, child life specialists, also play an essential part in helping children recuperate and heal. According to Child Life Council, there are about 5,000 child life specialists across the nation. Child life specialists not only take the child’s physical health into consideration, but also focus heavily on the developmental and psychosocial aspects of a child’s well-being. This provides child life specialists a broad and unique perspective into a child’s life. Some children, for example, have to be hospitalized for weeks to months at a time. Not only does this pull children out of school and delay their learning but it removes them from social situations that they would otherwise have with their peers. A large part of child life specialists’ job is ensuring children have a “normal” childhood, with opportunities to grow and learn academically and socially, just as any other child would. Additionally, these specialists are there to help family members cope and adjust to their child’s life inside the hospital. A prominent valley hospital utilizing these incredible specialists is Phoenix Children’s Hospital (PCH), the largest freestanding children’s hospital in Arizona. At PCH, child life specialists are part of a larger group, the Child Life Program. This program employs twenty-five child life specialists, eleven child life assistants, and six staff members who work in the hospital’s school. According to a family quoted in a Cronkite News article, a child life specialist was deemed “a life saver for helping the family get through this tough time.” Not only do the specialists help the patient, they also help the patient’s siblings and family members understand, in layman’s terms, the medical procedures involved with the patient’s hospital stay. B3 Strategies has had the opportunity to meet some of these specialists during various tours with legislators, staff, and members of Arizona’s Congressional delegation, and they are every bit as kind and enthusiastic as people describe. Child life specialists are rewarded by having an extremely positive influence on the patients and families they work with on a daily basis. PCH’s commitment to their patients overall well-being is clear through their commitment to the Child Life Program. The work of these specialists ensures children receive the proper attention they need during what would otherwise be a traumatic and scary time in their young lives. B3 Strategies is proud to represent Phoenix Children’s Hospital. For more information on our work with PCH, please visit www.b3strategies.com/clients/. 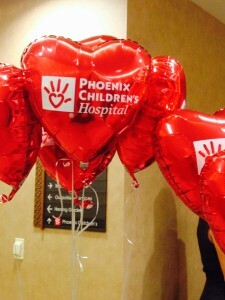 For more information about PCH and how you can help support pediatric patients in the Phoenix community please visit www.phoenixchildrens.com.